Successfully Added Foxwear F28 Bluetooth Watch - Bluetooth 4.0, IP67, Pedometer, Calorie Counter, Sleep Monitor, Call And Message Reminder to your Shopping Cart. Meet the Foxwear F28 Bluetooth Watch. This premium watch features a high-end leather strap and comes with a zinc alloy dial. With its beautiful and sleek body, this smartwatch can be worn confidently with any of your outfits. It features a full-black design that comes with orange details which gives it a casual yet sporty look. The watch itself is IP67 waterproof, meaning you can wear it in the shower or out in the rain without needing to worry about accidentally breaking it. Whether you wear it at work or in the gym – this Bluetooth watch is sure to match your style. 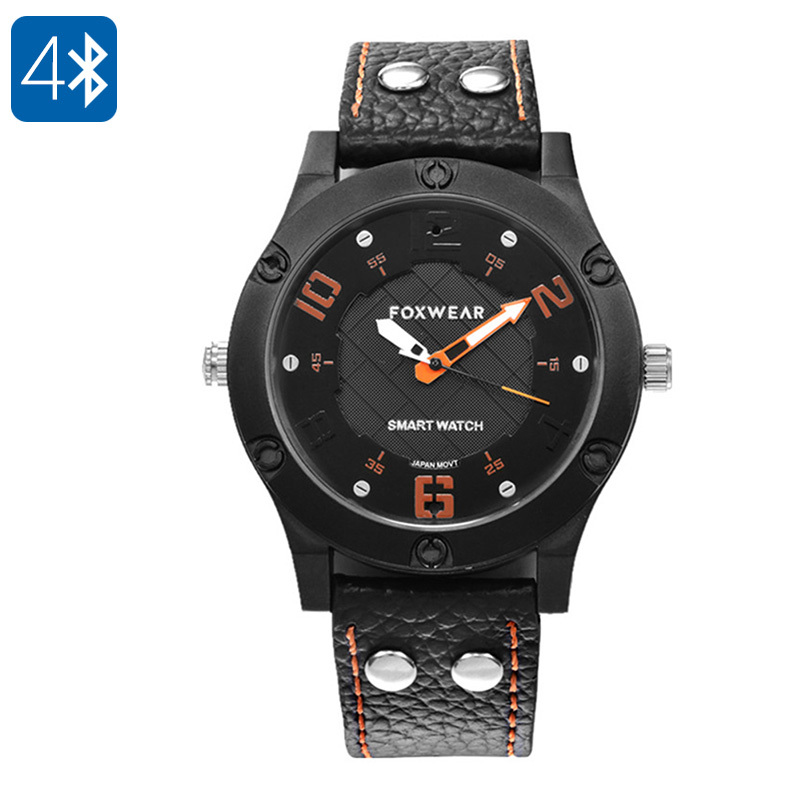 From the outside, the Foxwear F28 Bluetooth Watch may look like any regular clock, however, its Bluetooth 4.0 support allows you to synchronize it with your iOS or Android smartphone. Once done so, your smart watch will treat you to numerous of sports features as well as call and message reminders. Thanks to this, you can be assured that you’ll never miss out on an important phone call again. For all sports lovers out there, this Bluetooth sports watch features an abundance of smart health and fitness features. Its pedometer keeps accurate track of the total number of steps you take throughout the day. This will motivate you to move more in order to stay healthy and meet your daily activity goals. Additionally, this Bluetooth watch also features a calorie country. This useful little feature shows you exactly how much energy you have burned throughout the day. Thanks to this, you’ll be able to meet your upcoming fitness goals with the least amount of effort. With a sleep monitor in place, this fitness watch even keeps track of your sleep quality to make sure you’ll get all the rest needed before starting your next workout session. This sports watch comes with a 12 months warranty, brought to you by the leader in electronic devices as well as wholesale Bluetooth watches..